Progress in drug testing and regenerative medicine could greatly benefit from laboratory-engineered human tissues built of a variety of cell types with precise 3D architecture. But production of greater than millimeter sized human tissues has been limited by a lack of methods for building tissues with embedded life-sustaining vascular networks. Multidisciplinary research at the Wyss Institute has led to the development of a multi-material 3D bioprinting method that generates vascularized tissues composed of living human cells that are nearly ten-fold thicker than previously engineered tissues and that can sustain their architecture and function for upwards of six weeks. The method uses a customizable, printed silicone mold to house and plumb the printed tissue on a chip. Inside this mold, a grid of larger vascular channels containing living endothelial cells in silicone ink is printed, into which a self-supporting ink containing living mesenchymal stem cells (MSCs) is layered in a separate print job. 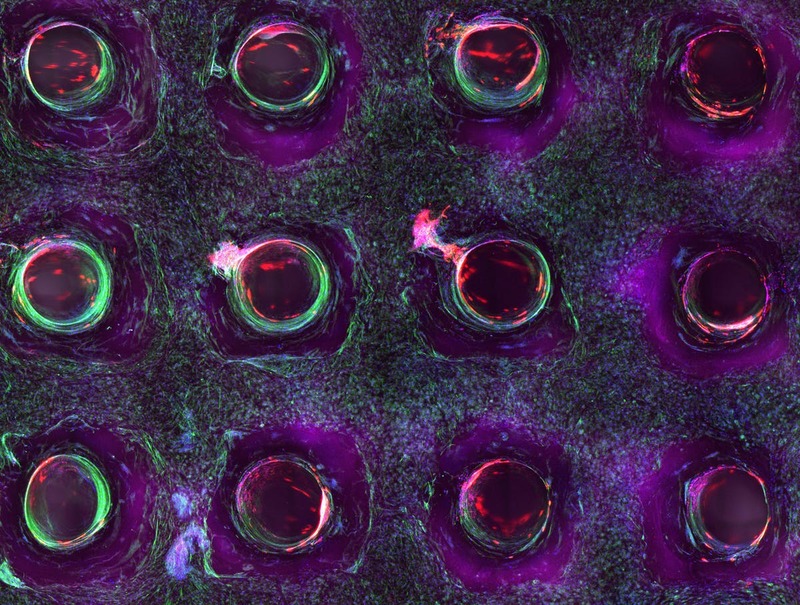 After printing, a liquid composed of fibroblasts and extracellular matrix is used to fill open regions within the construct, adding a connective tissue component that cross-links and further stabilizes the entire structure. The resulting soft tissue structure can be immediately perfused with nutrients as well as growth and differentiation factors via a single inlet and outlet on opposite ends of the chip that connect to the vascular channel to ensure survival and maturation of the cells. In a proof-of-principle study, one centimeter thick bioprinted tissue constructs containing human bone marrow MSCs surrounded by connective tissue and supported by an artificial endothelium-lined vasculature, allowed the circulation of bone growth factors and, subsequently, the induction of bone development. This innovative bioprinting approach can be modified to create various vascularized 3D tissues for regenerative medicine and drug testing endeavors. The Wyss team is also investigating the use of 3D bioprinting to fabricate new versions of the Institute’s organs on chips devices, which makes their manufacturing process more automated and enables development of increasingly complex microphysiological devices. This effort has resulted in the first entirely 3D-printed organ on a chip – a heart on a chip – with integrated soft strain sensors.